This year I’m actually using a planner. The beginning section is for thinking about the season you’re in and planning your focus for the year. I’ve have never really done this before, but it set me thinking over the last couple of months and especially the last couple of weeks. I began with the idea of Diligence, but the word didn’t quite fit with what I had in mind. 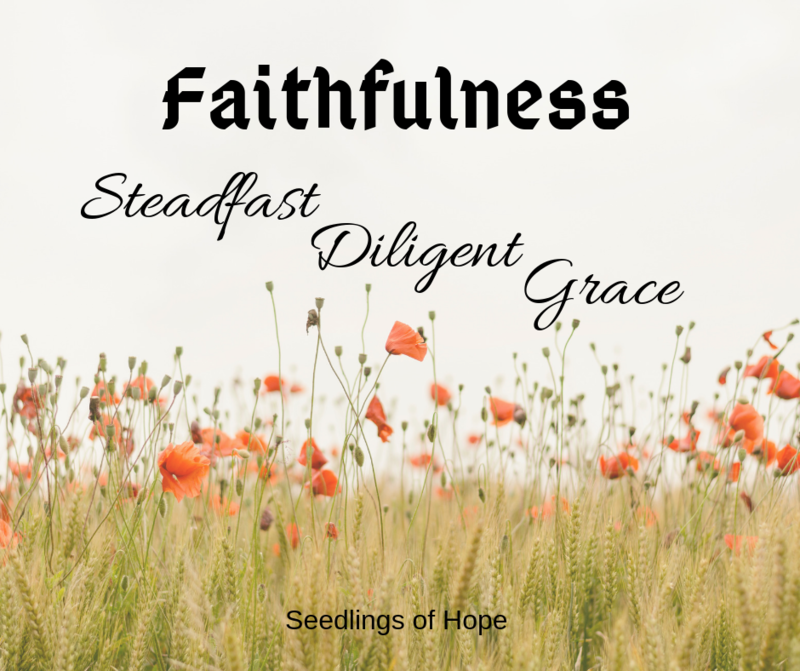 After searching through a Thesaurus I came around to Faithfulness – Steadfast, Diligent, Grace. Faithful – reliable, obedient, constant, steadfast, diligent and grace- these are how I want to respond to life this year. God is always faithful. He never fails to care for us, but it is so easy to get side-tracked and distracted. For me, I have several areas I want to focus on this year, the first two are a continuation from this last year, the third was an attempt took me the entire year to even come close. To start with, I want to continue with being faithful with my personal devotions. I have struggled with being consistent for years. This past year, I actually managed to get up (before most of the kids) on a daily basis in order to spend time in Bible reading, devotions and prayer. For me, this is the only way I can get it done. Another area I want to continue with is our finances. 2017 hit us hard financially with medical bills wiping out all savings and needing to use our line of credit through the bank and our family vehicle detonating. This past year, I have tried to watch our spending carefully in an effort to regain some margin of safety for the next emergency or break down. We are gaining slowly. Next, our homeschooling. We have enough of a routine to do schoolwork consistently, but I have had to really put thought into what and especially how much we are doing or attempting to do. We have a large age gap between our oldest 3 and the younger 5. Three years ago (plus a little), I switched from dealing with mostly independent learners to mostly beginners with babies (twins) and a toddler in the mix. I missed that I needed to change my focus to just the basics and we have since figured out that we also have one with more severe dyslexia. I have had to split lessons sometimes over 3 or 4 days to get them done and cause less stress on him and me. Grace may not seem connected at first, but I’m not very easy on myself when I feel I don’t measure up to what I feel I should be doing or getting done what I feel I need to. Notice I said “I feel I should.” Most of the frustration is my own doing. NO ONE else is telling me I have to get these projects done. I want to remember to grant myself grace when I don’t get things done as quickly as I think I should. God has already granted it, but I forget. We want each of you to show this same diligence to the very end. You set great priorities for the year, Heidi.